You're gonna want to read this one! It's BIG! And no, I'm not pregnant. I've always wondered what it felt like to have your dreams come true. Just imagine something you've dreamed about, talked about, planned for, and hoped for; then one day, all of the sudden your dreams are coming true. In the last couple of months, Colin and I have watched our dreams become a reality, right in front of our eyes. We are excited. He is thrilled! I am nervous and worried. It's definitely a bundle of emotions all mixed up into one. It has definitely been a process and hasn't happened over night. Way back when Colin and I were dating, we would lie in the grass and talk about our future together. Kids, a big house, nice cars, and maybe travel. Maybe even living abroad. Colin grew up in South East Asia. He lived in Bangkok, Shanghai, and Taipei. He went to High School in Taipei, Taiwan, and absolutely loved it. He returned to Taiwan for his mission, serving in the southern mission of Kaohsiung. He speaks Mandarin so we knew that if we did live abroad, it would likely be a return to Asia. Colin grew up the son of a government employee, his dad works for the state department. But, he always dreamed of being a business man in a foreign country. So, he went to school and got his undergrad in Business and Finance and his Masters in Business Administration. We worked so hard putting him though school, two and a half of the hardest years of our lives. We knew though, and had faith, that in the end our sacrifices would pay off. Our mantra at the time was, "Short term sacrifice, long term blessings". Colin got his first job just a few weeks out of BYU at Goldman Sachs. He's been working with the firm ever since. Colin is such a hard worker, extremely loyal and dedicated to his work. He puts in very long hours and sacrifices a lot to make his career what it is. Back in January, talks of relocating became more and more frequent. Colin has expressed a desire, and the firm has expressed an interest. The more they looked in to hiring Colin for this position, the more sense it made to them. They didn't even know at first that he speaks Mandarin or had lived in Asia. In May we received an offer to relocate but the offer needed a little bit of tweaking. Last week we were able to come to an agreement. 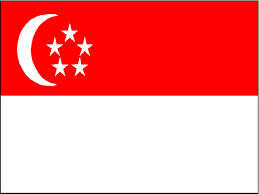 We are so excited to announce that we will be moving to Singapore with GS. I am so excited for what this means to us. This move will be a huge step in Colin's career, it will be a life-changing experience for the kids, the education will be phenomenal for the kids, and it'a chance for me to get to experience Asia with Colin for the first time. I will miss my friends and family terribly but I know that this is the right move for us and we feel so overwhelmingly blessed to be placed in this situation with these amazing opportunities. For those of you who may be wondering, let me tell you a little bit more about Singapore. It's located in Southern Malaysia. It's a city-state and and island. The whole country is about the size of San Diego County. The official language is English! (yea!) And there are a mix of people and cultures there. Many Chinese, Indian, and Maylay people as well as a large population of expatriates. Singapore is touted as one of the world's cleanest cities. It's known for its business and has one of the five busiest ports in the world. It's definitely a first world country and is an urban city with many high-rise buildings. Our church has a good presence there and I think there are two American wards. There are many American and international schools and the boys will be attending one of them. So. That's the big news! We're moving to Singapore. Pinch me. It doesn't even seem real. We've just started the process of applying for schools, searching for apartments, getting our visas and trying to figure out how to move our lives over seas. We haven't officially decided on a date yet but we're aiming for September first. Remember how we moved a little over a year ago? Yeah. I get to pack it all up again! We're selling both of our cars (and a few other random things) and renting out our house so if you know of anyone who may be interested, please send them my way! its finally official! awesome news.. we will miss you guys a ton! but what an amazing adventure! Holy Cow!!! That is an amazing opportunity. :) You guys will love it. I wish you all the best and can't wait to see what fun adventures you will have! Just barely catching up on my blog reading- such exciting news! You're going to love Singapore! It's a beautiful city and so accessible to the rest of Asia pacific. Start saving for travel now and sign up for Air Asia emails 😊 Do you know how long you'll be there? I'm sure we'll be back at some point or if you ever make it down to Melbourne you'll have a place to stay!